Note that Pentacryl, our green Wood Stabilizer, displaces the moisture in wood and leaves a thin coating on the wood cell walls. This prevents the cells from shrinking, which significantly reduces the cracking, checking and warping during the drying process. Because it is pushing the water out, Pentacryl speeds the drying time by approximately 30%. However, remember that your wood still needs to dry SLOWLY. Smaller pieces of wood can be put into a cardboard box or buried in wood shavings, while cardboard can be taped to the side of larger pieces. The end grain will dry first, so an End Grain Sealer can be applied to this area to help slow down and even out the drying. The idea is to get the middle of the wood to dry at the same rate as the outside. For the popular cross-cut sections, also known as “cookies”, stand the slabs of wood on end so both sides can dry evenly. 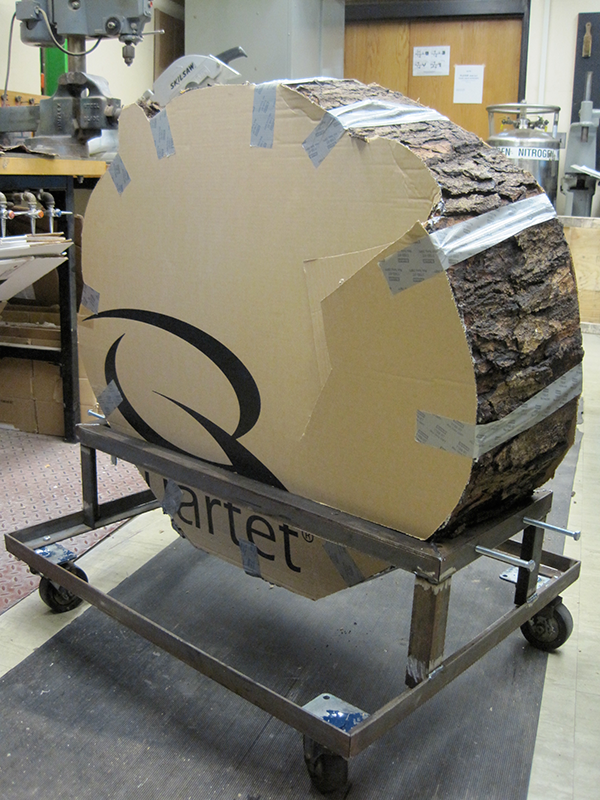 Ideal drying conditions are 25-55% relative humidity and 50-70 degrees F.
A special drying stand was built for this 48″ diameter x 8″ thick Maple cookie. Due to its size, End Grain Sealer and cardboard were applied to both sides. Often you may want, or – in the case of a client – need to work with the wood right away. Unfortunately, there is no magic formula to speed the drying. If you apply heat or a fan, you can get rapid cracking. Don’t apply a finish too soon, or you will trap remaining moisture inside the wood, and it can rot from within. Be patient so all your efforts will not be wasted on cracked wood. During the cold winter months we can easily lose track of how damaging the sun’s UV rays can be to our leather items. Furniture placed in front of windows can sustain sun damage from fading. 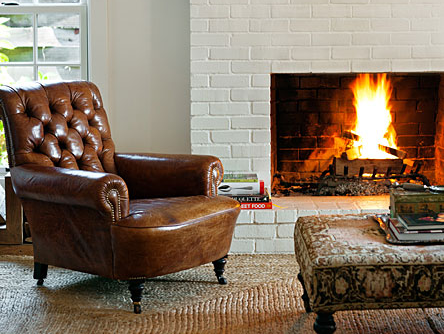 Warm air circulating from furnaces and fireplaces can promote dryness. Cold and snow can take its toll on leather garments, shoes and hand bags. The leather seats in our cars transition from freezing to warm temperatures in a short amount of time. Leather is like the skin on our body, the pores need to be kept clean and be nourished. A gentle Leather Cleaner should be used first to remove dust and dirt from the surface of the leather. Then apply a safe conditioner, like our Leather Saver. This product does not contain glycerin or sulphated oils which can cause hydrolyzation leading to acid rot. The products should be applied every 1-3 months, depending upon the type of leather and the humidity in your area. This maintenance routine will prevent future damage, extend the longevity of your leather and best of all keep it looking great! 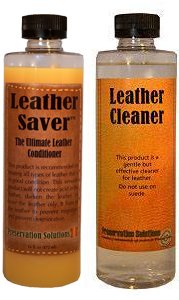 Preservation Solutions’ Leather Saver is a highly rated conditioner that will prolong the beauty and longevity of your leather. Leather Saver prevents cracking and premature aging by restoring essential oils that are good for the leather. Preservation Solutions’ Leather Cleaner will help your leather last many years. Cleaning is the 1st step in leather care. Leather becomes worn and dull looking because dirt and dust clog the leather’s natural pores. Leather should be cleaned prior to conditioning so dirt is not rubbed into the leather. 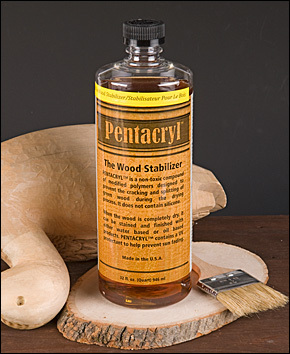 Preservation Solutions’ Pentacryl is a wood stabilizer used by wood carvers, woodturners, furniture makers and anyone working with green wood to prevent it from cracking, checking and splitting during the drying process. Pentacryl is used on a wide variety of projects by woodworkers globally. For a limited time, try Pentacryl at 15% off for your next project.